Until you become a Mom, you can never understand that the phrase ” Sleep like a Baby” is sooo wrong. Babies and toddlers are supposed to sleep long hours right? Right, like that’s going to happen so easily. When you have a toddler like me, who hates sleeping, and never sleeps more than half an hour or maximum an hour throughout the day, gets up the moment you leave the bed, never leaves you alone for a second. How are you supposed to get anything done in the house? Whatever chore you are doing, involve your kid in it. 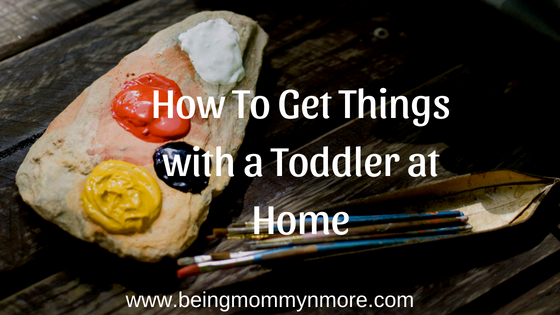 Toddlers love getting busy, there is a reason your house looks like a warzone at the end of the day right? Why not use all the toddler energy to some use? YOu can give them small tasks If you are drying cloths, ask them to give them to you from the basket. KIds loves playing with utensils, if you are cooking, you can let them play with it or ask them to put few veggies in a bowl, if you are cleaning, ask them to put their toys in place. Now, you know that the chances of them doing what you asked or doing it correctly are dim, but it gives them something to do, to put their energy. They might make a mess of things, but trust me its worth the few minutes you get to complete important tasks. This one is easier said than done, my toddler follow around like a tail. I can’t even pee in private. My high demand toddler doesn’t like my focus anywhere else than him. He wants me to play with him, sit with him, or simply be with him all the time. It ‘s really hard to have him busy somewhere else for long time. Try to find what activity engage him or her most, what he or she absolutely loves to do, what’s his favourite toy, these are things which are going to keep him busy most and help them play independently. Sometimes, having a toddler at home feel similar to being constantly under surveillance cameras, you can’t escape their eyes. For a baby or toddler you are like his safety net, especially if you are a nuclear family. So, let them trail you, wherever and whatever you are doing, let them play hear you, the sense of comfort and safety they feel in your presence will help them engage in their activity better, instead of them coming to looking for you . Duh! We are women, multitasking is in our genes, but with kids in house, you will have to double your multitasking skills. If you are a a person who loves schedules and order, who likes to plan out everything, be prepared for your schedule to go down the drain at anytime. Everyday with a toddler will come a new challenge, a new tantrum, new scraps and wounds. Don’t let it frustrate you. Multitask when you can, but also take a break once in a while. HOw do your manage things at home with a toddler at home? Got more suggestions? Tell me in the comments section.